The penultimate day of the freestyle in Fuerteventura saw more explosive action as the men’s double elimination was completed, while the second single elimination of the women’s was also finished. Today saw so many incredibly close heats in the men’s division to show that almost anyone on their day is capable of beating anyone else. However, by the end of Day 4 the men’s competition has been completed and it is Gollito Estredo (Fanatic / NorthSails), who makes a winning start to the year with another incredibly stylish display, while Sarah-Quita Offringa (Starboard / NeilPryde / Maui Ultra Fins) remains on course for a 10th PWA Freestyle World Championship. Sarah-Quita Offringa and Maaike Huvermann (Starboard / NeilPryde / Maui Ultra Fins) lined up for their second duel of the week in the winners’ Final. Huvermann is gradually bridging the gap between herself and Offringa as she landed shuvit spocks, regular konos and also sailed away from a culo. However, Offringa remains in a league of her own with the style and execution with which she executes her moves and deservedly maintains her perfect record. Arrianne Aukes (Fanatic / NorthSails / Maui Ultra Fins) posted her highest total contest so far in the semifinals, but unfortunately, she was up against Sarah-Quita Offringa (Starboard / NeilPryde / Maui Ultra Fins). However, Aukes carried that rich vein of form into the battle for 3rd and 4th place to take down Oda Johanne (Starboard / Severne / Maui Ultra Fins) to claim the final place on the podium. Yentel Caers (JP / Point-7) fought his way back onto the podium as the young Belgian produced a couple of magnificent performances to firstly defeat fellow Steven Van Broeckhoven (JP / NeilPryde / Shamal Sunglasses) in a heat almost too close to call, before exacting revenge against Italy’s Jacopo Testa (RRD / RRD Sails / AL360). However, that victory came at a serious cost with the 22-year-old being forced to retire before facing Amado Vrieswijk (JP / Severne) after injuring his foot upon landing a shifty. Caers thought that he’d broken his leg, but initial reports suggest that that is not the case, but he will be getting fully checked out this evening. Everyone wishes Yentel a speedy and successful recovery. 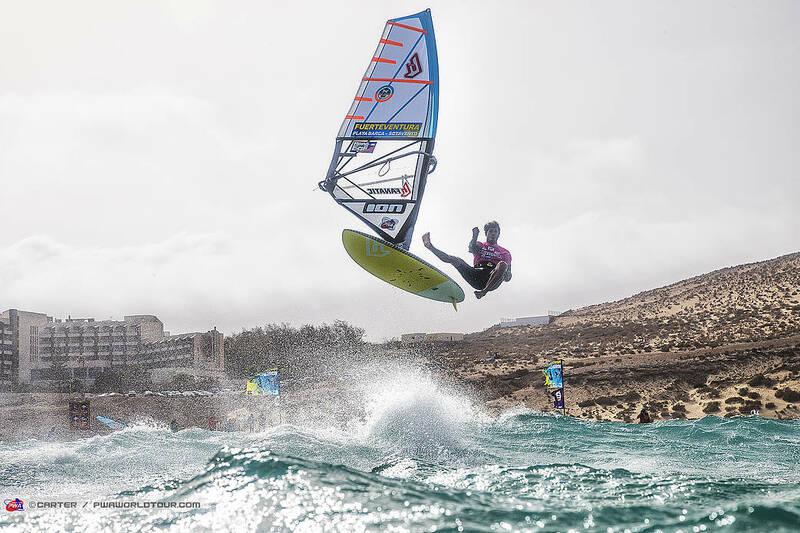 Testa will be disappointed to have lost his place on the podium, but still walks away from the opening event of the year with his best ever result on the PWA World Tour. With Caers forced to withdraw, Vrieswijk and Gollito Estredo lined up for a repeat of the single elimination winners’ final. Vrieswijk came into the Fuerte as the reigning event champion, but in order to successfully defend his title, he would have to beat Gollito twice. Elsewhere, Dieter Van Der Eyken (Starboard / Severne) and Antony Ruenes (Tabou / GA Sails) finished in joint 7th place. The Belgian defeated Sam Esteve (JP / NeilPryde) by producing a buzzer beater as he landed a spock culo before losing against Van Broeckhoven. The forecast looks windy again for tomorrow, which should see an exciting finale to the second women’s double elimination, while we will also be holding a big move contest for the men. The sailors will meet again tomorrow morning for the skippers’ meeting at 10:30am (GMT+1) - registration for the big move contest will be between 10:30-11am. The first possible start for tomorrow will be 11am. Make sure you tune into www.pwaworldtour.com to watch all of the explosive action as it happens via the PWA live stream.